For families who choose cremation, there are many options available - from a traditional service with a viewing to a simple cremation without any ceremony - our staff can help you plan a cremation that meets your needs. Saying that you want to be cremated does not mean that you cannot have a viewing and a service. This option is a good a choice for families who wish to have the body present for a traditional viewing and religious service, with the cremation happening after the public ceremonies. For those families who choose to bury the cremated remains in a cemetery, the Watkowski-Mulyck Funeral Home offers a wide range of urn outer burial containers. For families who wish to maximize their participation in the cremains burial, one option is the Cultured Marble Urn Vault (pictured at right) from Wieser-Doric Vault Company. 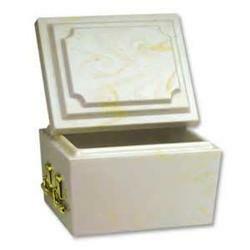 This urn vault has decorative handles which are designed and allow a dignified way for pallbearers to transfer the urn vault at your place of worship or the cemetery. NOTE: An urn outer burial container is not required by law; however, many cemeteries require an urn outer burial container for ground burial. A Memorial Service is when any public visitation or funeral service takes place following the cremation. This can be held at the funeral home, your place of worship, or any other setting. A simple cremation is our most basic cremation option, and is designed to meet the needs of those who desire an economical and no frills funeral. You can have a private ceremony, a scattering ceremony, a memorial service at a later date, or you could have no rites or ceremonies at all.